I had to reinstall Windows on my laptop at work, which is also the machine that I use for listening to music. I have a Zune Pass, which means I can download as much stuff as I want. Unfortunately, I forgot to back up my downloads last time, so I’m re-downloading the things I listen to the most (which is okay, because this machine isn’t meant for lots of music, given its small hard drive). The very first thing I went to download was the new album from Dååth, The Concealers. Mmm, Dååth. Instead of downloading the album, I was greeted with a bunch of yellow warning icons next to all the tracks, telling me something went wrong. If you click on the web help link, it sends you off to a page which suggests that the problem is that your clock is set incorrectly. Nope, my clock was correct. I checked all my paths. I checked security settings. I tried another album, and it worked. I tried yet another album, and it failed, but it did so in a very telling way. The album is question was one that I had purchased (with my 10 free songs/month, but that doesn’t matter). 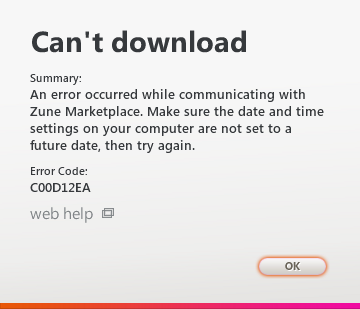 When you purchase music from Zune, sometimes the label will let you re-download it and sometimes they won’t. Fine, I’ve never really required a re-download system before (knock on backup wood). Except, now I’m stuck without the ability to even download a DRM’d Zune Pass version of the album, because now it knows I own it (and when you own the album, the ‘download’ feature silently becomes a ‘re-download the MP3s’ feature, rather than downloading the Zune Pass DRM’d version). I’m forced to get copies from home into work now, so I’m using Windows Live Sync to download them – one album at a time – from my home PC onto my work laptop. Such a pain. I sure hope they fix this!